The Agency for Development of Small and Medium-sized Enterprises (SMEs) of Azerbaijan has obtained the right to participate in all exhibitions organized by Iteca Caspian LLC, Orkhan Mammadov, chairman of the board of the Agency, told reporters in Baku Dec. 5. He said that in this regard, the Agency signed a memorandum of understanding with Iteca Caspian LLC, Trend reports. “The agency will support and provide the appropriate assistance to SMEs interested in participating in exhibitions,” he noted. Speaking about the Bakutel exhibition being held in Baku, he said that as part of the KOBI Destek program, the Agency for Development of SMEs of Azerbaijan together with the Ministry of Transport, Communications and High Technologies of Azerbaijan created conditions for startups, micro and small enterprises to participate in the exhibition and demonstrate their innovations. 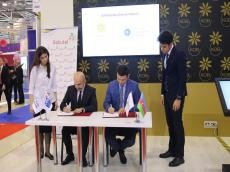 In addition, Mammadov noted that as part of the exhibition, the Agency for Development of SMEs of Azerbaijan and the Ministry of Transport, Communications and High Technologies presented an innovative program to support entrepreneurs. He added that changes in tax legislation were recently discussed in the Azerbaijani parliament, and as part of these changes, certain benefits for startups are provided, and in the near future, certain benefits for SMEs will be fully made public. Speaking about the activities of the Agency, he noted that during the five months of its activities, three “Friends of SMEs” centers, which are representative offices of the Agency, were commissioned in Masalli, Khachmaz and Siyazan districts of Azerbaijan.